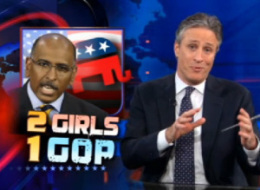 Fox News has an unlikely adversary: rapper LL Cool J. 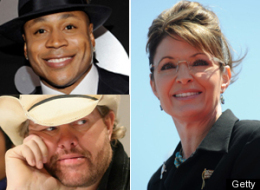 After the network announced that Sarah Palin would host a special Thursday called “Real American Stories” — featuring interviews with LL Cool J, Toby Keith and other celebrities — the rapper and country singer both hit back claiming they were lying. “Fox lifted an old interview I gave in 2008 to someone else & are misrepresenting to the public in order to promote Sarah Palins Show. WOW,” he tweeted. Fox News responded Wednesday morning, saying they would cut the footage of LL Cool J (aka James Todd Smith) from the special. Keith’s old interview is still slated to run. Wait a minute, so the minorities are learning to read, and then using it against white illiterates? This is, frankly, an outrage. Are The Right-Wing Extremists Courting Another Oklahoma City? It was almost exactly a year ago at this time that a “controversial” report was released by the Department of Homeland Security. This finding, labeled “Right-wing Extremism: Current Economic and Political Climate Fueling Resurgence in Radicalization and Recruitment,” explained that the lunatic fringe might use the recession and ascension of the first African-American president to recruit members and then plan violent attacks on the homeland. Although this effort was initiated under the administration of George W. Bush, the usual bed-wetters on the Right–especially a large Oxycontin-laced, self-indulgent buffoon with the ever-appropriate name Rush–whined and hissed about how it was a political jihad. Almost any criminal, psycho, drunk, wife-basher, drug addict or other prohibited person can buy a pistol illegally at a gun show – no questions asked. Test after test has found that many gun show dealers, licensed or unlicensed, sell deadly weapons to practically anyone with money, evading federal laws that forbid sales to the unfit. In fact, once the practices of these gun shows were exposed by undercover investigations, such as those planned by Mayor Michael Bloomberg of New York and his organization, Mayors Against Illegal Guns (Disclosure: I consult for MAIG; I am speaking for me, and only me, in this piece, however), the response was not to make it harder for criminals, terrorists and the mentally unstable to get guns at gun shows. It was to try and pass legislation to make such investigations illegal. Brilliant plan! Sweep it under the rug, and it is sure to go away. It is no matter, that as my friend Brian Rothenberg, Executive Director of Progress Ohio, has said, it is easier to get a gun at a gun show than cold medicine. Or that the recent shooting at the Pentagon, by an anti-government radical and mentally disturbed man named John Patrick Bedell, was able to occur because even after the state of California deemed him mentally unfit to have buy a gun, he just went to Nevada and bought em through the infamous gun show loophole. No background check. No questions asked. And then off to shoot innocent people at the Pentagon. But if you think this is bad, it is only going to get worse. Tea baggers are showing up to rallies brandishing signs with Brownings and the obvious implication. You know, the gun founded by the guy who the state of Utah would like to honor instead of Martin Luther King, Jr. Sarah Palin, Glenn Beck, Michelle Bachmann and the rest of the itsy-bitsy IQ brigade now like to put targets on legislators, encourage their supporters to “reload,” and are using other violence-infused imagery. Meanwhile, Christian Militia groups are putting together videos worthy of Al Qaeda while planning to murder Michigan police officers with guns and IEDS. Seriously, stop and watch this spooky video for a second (they even got the German music right!). What has been the response to the crescendo of incidents like these over the past few months? The Obama Administration is missing in action. Meanwhile, Republican legislators, like Senator Tom Coburn, are actively trying to put guns in the hands of the mentally unbalanced. That’s right, Coburn tried to attach an amendment to the health care bill to restore gun rights to veterans declared “mentally incompetent.” Seriously, does the man, and the 45 who voted with him, remember Ft. Hood?